What is it about the weeks between Thanksgiving and New Year’s Day that makes us turn into frazzled, frantic balls of stress? Why must we set expectations so high? We believe we can work a full-time job, successfully manage our everyday roles and responsibilities, and magically turn into a super human. There are all of these fancy parties and people looking fabulously festive with their perfect makeup, carrying homemade holiday cookies and a present that looks like it was wrapped by a fashion designer. An accurate Instagram and Facebook feed representing my life during the month of December would be images of me stuck in traffic on Veterans Highway, running into Walgreen’s at the last minute to pick up a gift card with a boring gift bag, sprinting through the local bakery for “homemade” cookies and scouring Pearl Wine for a random bottle of whatever bubbly is on sale. I know what my life feels like and looks like from October on … I am a hot-mess express and one second away from having my kids take an Uber to school. We need to take a step back from the chaos and consider the bigger picture; face the brutal reality that everything on our list is not going to get done; and no one will know otherwise if it does not. In between checking off who is naughty and nice, if we have a few rare moments, we should do something nice for ourselves. It is no surprise, if we look good, we feel good. Here are ALG Style, we suggest a flawless ensemble and possibly a little fitness time too. We are all extra crazy during these weeks, and ALG just does not want anyone to look crazy. Fortunately, we have found the chicest workout attire boutique that allows for both form and function during everything from sweat sessions to holiday shopping sessions. SWEAT is packed full of our favorite active fashion brands including but not limited to Koral, Onzie, Spiritual Gangster and Beyond Yoga. They have all the coveted accessories like Teleties hair ties, Jade yoga mats, and BRK water bottles. The lines are high-quality and high-style, and price points for their unique lines of clothing and accessories range from $40 to $170. SWEAT is the brainchild of Christina Calamia. Her love affair with spandex started at a young age. She grew up dancing; spent seven years with the New Orleans NBA franchise; was an LSU Tiger Girl; and went on to choregraph for the NBA, NFL and the movie industry. After giving up dance professionally, she found a huge void in her life. Calamia started taking small-group fitness classes, and soon became interested in popular wellness and fitness trends. “I found my groove through Barre workouts,” she says. “Barre made me fall in love with fitness.” With her new fitness obsession, the craving for high-fashion fitness apparel grew. “It started with ordering a pair of leggings and a sports bra for classes,” she adds. 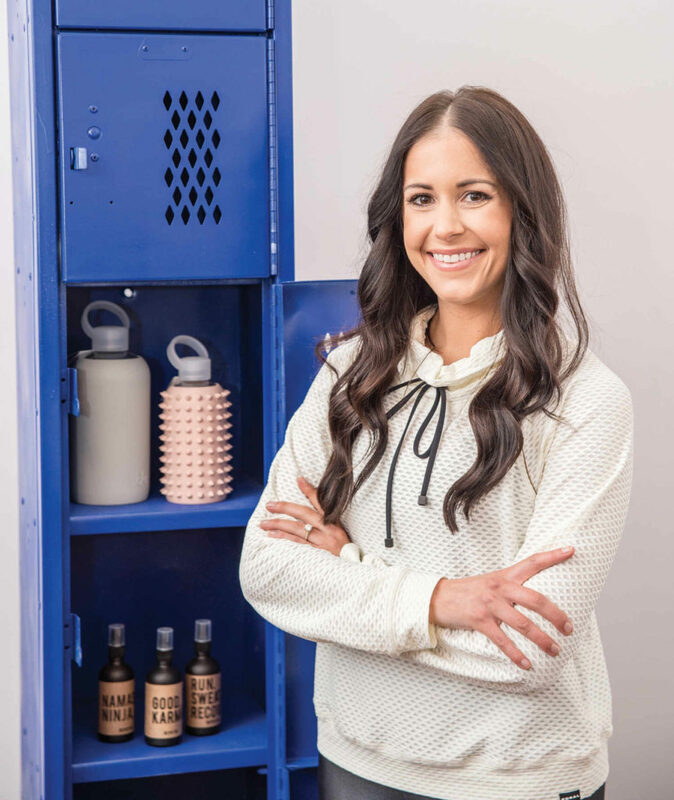 “I was receiving compliments on my gear and would naturally go in to explaining about the support, material, compression and so on, even though they did not ask.” Calamia saw an opportunity to marry her love of fitness and fitness attire to create SWEAT Boutique. Although ALG Style does not condone leggings at fancy parties or dinner, this athleisure wear trend is not going away anytime soon. ALG refuses to embrace leggings as real pants, nonetheless we strongly encourage looking posh in every situation and getting your fitness on is no exception. This holiday season, we want you to be able to get everything done as effortlessly as possible — from running errands to running the levee. While visiting SWEAT, be sure to pick up some fun stocking stuffers for the fitness enthusiasts on your holiday list. Happy holiday shopping and don’t SWEAT the small stuff!